Fall is upon us and for most of the country the signs are all around us. To most it is simply a change of season that produces some amazing leaf colors and some of the last gasps of summer weather. In other parts of the country it doesn’t mean much at all from a weather standpoint, but it does serve as a reminder that the holidays are just around the corner. That is all well and good, and all should enjoy it while it is here. For many of us though fall represents so much more. It is the culmination of an entire year’s worth of work, a time to dig in and get to the real work to realize the fruits of their labor; this is of course Harvest Season for legal outdoor Marijuana growers around the country. As the sun patterns change in sky and the days grow shorter the Emerald Triangle and many other beautiful grow regions begin to wake up to see their marijuana crops realize their full potential. It is a time of excitement as old friends from around the country converge to help with the harvest. A year’s worth of hard work and planning lead them all to this moment, and soon the full potential of all of their efforts will be realized. There is one job in particular that while necessary will often be met with debate, and that is the act of trimming the plants. It is widely accepted that you have to trim your plants in order to make them suitable for use, but what do you do with all of that trim? This debate has raged on in many circles, and many ideas have come and gone. With the changing landscape of the Marijuana industry some very viable options have become available to the grower, and with the growth of the concentrate and cartridge markets trim has taken on a new life. Years ago Farm To Vape introduced their line of “Thinner” products, and these have proven to be a very cost effective way for growers to turn this trim into top notch and stable cartridges to sell after the rush of harvest season is through. The cartridge market is going through an explosive growth period right now, and these growers now have a way to harness the power of their trim that was for so long looked at as almost useless. 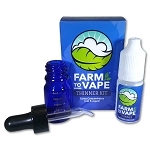 Farm To Vape released gallon sizes for these commercial operations to take advantage of all of this unused portion of the harvest, and small commercial operations have been blown away at how well the smaller 60ml sizes have worked for their trim needs. Cartridge use continues to gain widespread acceptance and Farm To Vape can help legal outdoor growers use their trim to help go to market with their own pre-filled cartridges or bottles of vapable marijuana oils. This truly is an exciting time of the year, and with Farm To Vape that excitement can continue on after the harvest is over. Wherever you are I hope your fall is a great one, but for those growers that have been waiting all year for excitement of outdoor harvest season; I truly hope this is a season of good fortune and a bountiful harvest. Enjoy the season my friends; it really is the best time of the year.